From our site in Poulton-le-Fylde, Lancashire, we grow and locally source branded and own label salad products for supermarkets, sandwich manufacturers, food service and wholesale markets. Further details on the produce we supply can be found on Our Products page. 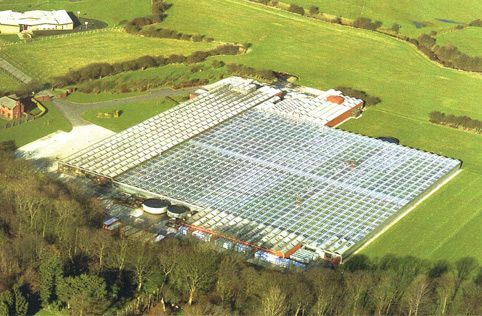 Our single roofed five acre glasshouse complex is equipped with the most advanced technology which contributes to growing and protecting the quality of our two main crops; Salad Cress and Pea Shoots. Choose British!- Trudie, our Commercial & Technical Director, has recently been to Iceland and heard how the Nation reacted when the economic crash happened to them in 2008. They created a “choose Icelandic” movement in their country and increased the production of home grown produce. Trudie thinks we could learn a few things from Iceland and wished we could have more of this attitude in the UK. New Micro Leaf Catering Box- Developed for chefs, restaurants and sandwich shops, our new Micro Leaf Catering Box contains 6 different varieties of Micro leaves packed in double lidded punnets. Dawndew Salad specialises in the growing, cutting, washing and packing of Salad Cress for sandwiches, salads and garnishing. However, we have recently converted the use of some of our glasshouse for the production of Pea Shoots and Micro Leaves. Ingle’s Dawndew Salad Ltd specialises in growing, washing and packing a variety of niche salad products for the sandwich, food service and retail industry, supplying customers of varying sizes. Privately owned, known widely as ‘Dawndew Salad’, we are a family run business with more than 100 years horticultural and growing experience. Our two principle crops are Salad Cress and Pea Shoots, both of which are grown in accordance with the Assured Produce Scheme. In addition, we work closely with local growers and manufacturers to supply an extensive range of complimentary salad products, including, but not limited to, Beansprouts and Prepared Mixed Lettuce. Our production operation and attention to Food Safety is underpinned by our Quality Management System, holding BRC Accreditation at ‘A’ Grade level since 2003. We apply an ongoing programme of product development and continue to invest in both our employees and production facility. This enables us to launch new products such as our ‘peat free’ retail punnet of Salad Cress and our Baby Leaf Pea Shoots. Based in Poulton-Le-Fylde, Lancashire, we offer a UK wide delivery capability.